Kent Toastmaster & Master of Ceremonies for the Kent & London area Jim Cattermole Home. The Kent Toastmaster, Jim Cattermole. Home. What can the Kent Toastmaster do for you? Please feel free to contact me for a no obligation consultation. 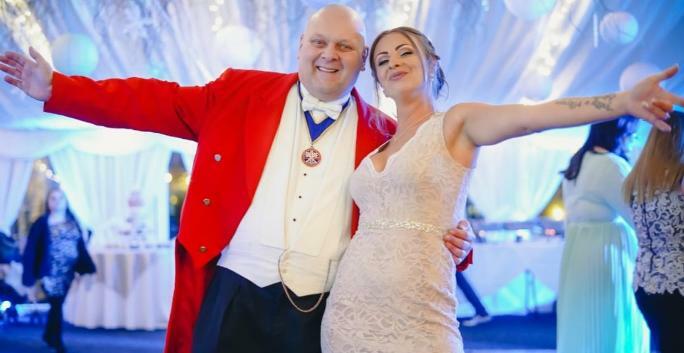 Your wedding day is one of the most important days of your life, my role as your toastmaster is to guide and support you before the big day as well as on the day. I will ensure it is one of the most wonderful, relaxed, and well-planned events you, your families, and your friends will have attended. I will work with you on every aspect of your wedding, and will ensure my service fits the needs and requirements you have put in place. Then on your big day, I will be there to make sure everything goes smoothly and you have the best day possible. I have been trained to the highest standards currently available in the profession. I do not drink any alcohol whilst working for my clients. I do not ask to be fed while working for my clients. I would rather be working than eating as that is what you have paid me for. I have £5.000.000.00 Public Liability Insurance. Which means you can be assured that whatever the function you have hired The Kent Toastmaster for, you can relax and enjoy yourself knowing that someone trained in all aspects is taking care of all the details. I pride myself on my style, being as formal or informal as required but always carry out any duties to the very highest standard. My role is to liaise with everybody involved throughout your event to ensure it proceeds effortlessly to a successful conclusion. I am more than happy to travel Worldwide to add that extra 'Something special' to your occasion. I am often asked what is the correct title, Toast Master or Toastmaster, it is Toastmaster one word.